Sam Himself is a bit of an enigma. He infuses his songs with a dash of rock and a pinch of soul, creating something that is unpredictable in the way that all good Americana is. 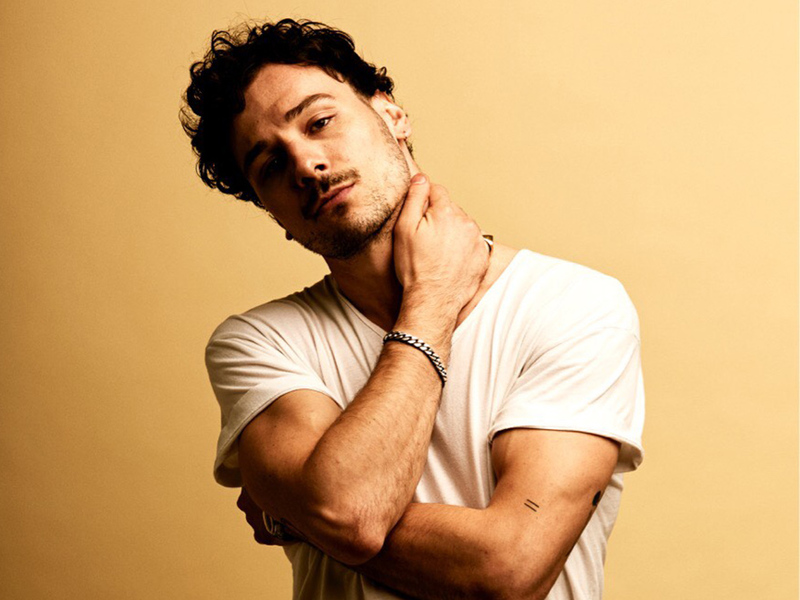 His first EP, Songs in D, released in 2017, was bursting with singer-songwriter ballads that reminded critics of Leonard Cohen. His recent follow up, Nobody, explores the many other nuanced roads of American music. Songs vary from upbeat new wave, to introspective indie, to anthemic rock à la Springsteen. The one constant in his eclectic music is his emotive baritone timbre. It tells quite a story. The singer may have had his doubts, but he is showing signs of success with his recent EP. Check it out below and read on to take a trip through Switzerland. Ok you’re planning a road trip across Switzerland. Where’s your start and end? We’ll start in Basel, my hometown between the borders of France and Germany. From there we’re driving south to Ticino, the Italian part of Switzerland a few miles north of Milan. By car, it takes about as long as getting from New York City to Baltimore. I mean if you want the proper Swiss experience, we should really take the train, which, as you can imagine, runs on time like nobody’s business. If there is ever a delay of more than 30 seconds because a meteorite struck the planet or something, the conductor will apologize personally. But we’re all (almost) Americans here, so I guess we’re driving. Best place to grab that much needed espresso and some breakfast before a long day on the road? Hotel Krafft in Basel. They have a lovely restaurant with big windows right on the Rhine River. I think the hotel is where Hermann Hesse wrote most of “Steppenwolf,” so there’s that. Might not be the ideal breakfast read, though. 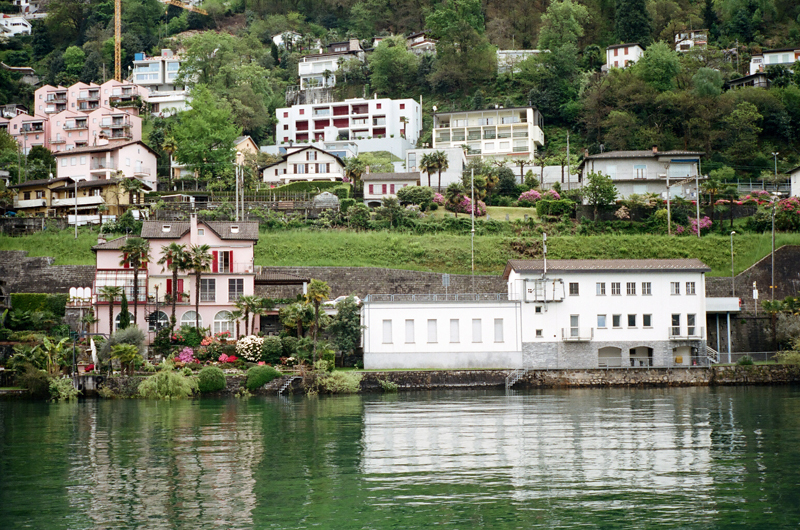 What are some must-sees in the Swiss countryside? Depends on our route. 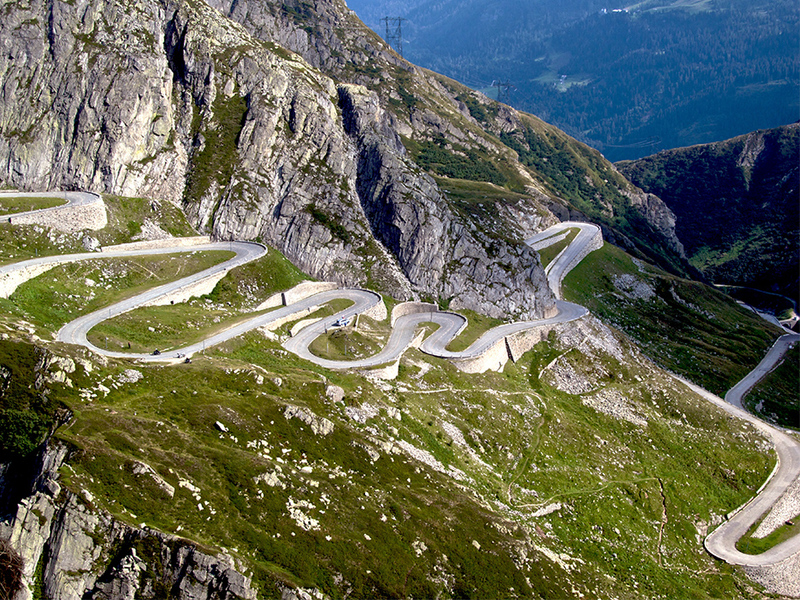 I recommend we take one of the many mountain passes, like the Gotthard or the Julierpass. My family used to make that trip all the time when I was little, and I hated it because I’d get carsick on the steep serpentine roads. When I go there now, I stop the car and weep in awe. It’s like driving through a painting. And if we’re lucky, we might catch some locals playing the alphorn to the echo of the mountains, no joke! Further south, we can cool off in the Maggia River with some serious rock diving before we reach the shore of the Lago Maggiore, the lake I’m taking you to. It’s all must-sees along the way. I’m getting homesick just talking about it. If you had a playlist for the trip with Swiss artists only, who would you include? Mani Matter: In my book, any discussion of Swiss music starts with Mani Matter. He’s not just a singer, more like a national poet laureate. All his songs are in Swiss German, though, so you’ll just have to take my word for it. Navel: When I started going to shows as a kid, Navel was the hottest ticket in town. No one went wilder onstage. They were total punks too. I remember them making up a fake NME quote about their own music and putting it on their posters. They had a moment, and I’m glad I was there for that. The Young Gods: The Young Gods are elder statesmen at this point, but I’ll still listen to them. So did Bowie by the way; he gave them a shout-out in an interview once. Not too bad for a bunch of Swiss industrial rocker dudes. Crimer: This guy is new, I think he’s Swiss German like me. Strong hair, nice Depeche Mode vibe and dance moves for miles. Yello: If you’re looking for hits, Yello is where it’s at. The duo wrote one of the biggest Swiss smashes of all time, “Oh Yeah.” You’ve probably heard it. To me, the tune reached immortality when it became the theme song of Duffman in The Simpsons. Sophie Hunger: Sophie is a killer songwriter, one of our biggest talents right now. She’s very Swiss in that she sings in multiple languages, and very international at the same time. I saw her at Webster Hall a few years ago. I walked out of there thinking, alright, maybe a Swiss person can do this after all. Krokus: This list wouldn’t be complete without Krokus. They were a big deal in the 80’s, sort of the Swiss AC/DC, for better or worse. When I was about twelve, I met their front man at a train station. I had just started my first band and I think I asked him for musical advice or something. He was like, and I’m not making this up, “Three words: jam, jam, jam!” So that’s Krokus for you. Stephan Eicher: Ok, more Swiss hits. Before Eicher became a Swiss French troubadour in his own right, he had a big song with Grauzone, his band at the time, called “Eisbär” (polar bear). The chorus goes something like: “I want to be a polar bear because polar bears don’t cry.” That’s the one Swiss jam my friends ask me to play at parties. Stress: Probably the biggest name in Swiss rap, which is totally a thing. He’s massive in France too because he raps in French. My younger sister, my seriously cool and badass younger sister, I might add, came to visit me in New York once, and the only time she got star-struck was when we caught Stress sipping prosecco in the West Village. I could go on, but by the time we’ve listened to all these artists, we’ll have crossed half the country. Any unusual landmarks we should know about? If we drive across the Gotthardpass, we’ll pass by this narrow stone bridge traversing a murderous gorge. I think it dates back to the 12th We call it the Devil’s Bridge, because, according to legend, the devil built it for the locals in exchange for the first soul that crossed the bridge. So they sent over the village dog. For some reason, that story is deeply Swiss to me. Where’s a good spot to try and get to for sunset? Let’s go to Ascona, a small town with a charming little lakeside promenade (I’m starting to sound like my mom here). We can load up on Gasparini ice cream and watch the sun go down over the Isole di Brissago, two tiny islands in Lago Maggiore with a botanical garden on one of them. Best place for dinner and beer/cocktail at your final destination? In the Ticino region, there are these small restaurants in the mountains, called Grottos. My favorite one is La Baita, up the hill from Magadino. We’ll sit down at one of maybe five tables and get one dish, polenta con spezzatino di manzo. No menu, no vegan option, no funny business. Most likely we’ll just eat till we faint, lest the owner give us hell. If we’re still standing, we can play cards with the locals, lose all our Swiss francs and go home in disgrace. You’re not too tired and you’d like to catch a show, best venue? Bar 3000 in Zurich. The club it’s part of, Zukunft, is about as close to Berlin debauchery as you can get this side of the Rhine. I’m also playing a show there on July 31st, so it’s got to be good.